Welcome to the Victorian Resources Online East Gippsland site. 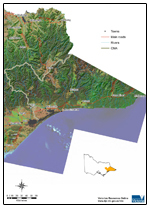 This is your gateway to a wide range of resource information for the East Gippsland catchment management region. The East Gippsland region covers some 20 800 square kilometres - representing about 9% of Victoria's total area.